An ancient Indian sweet, often found piled in pyramids in the sweet shops of Delhi. 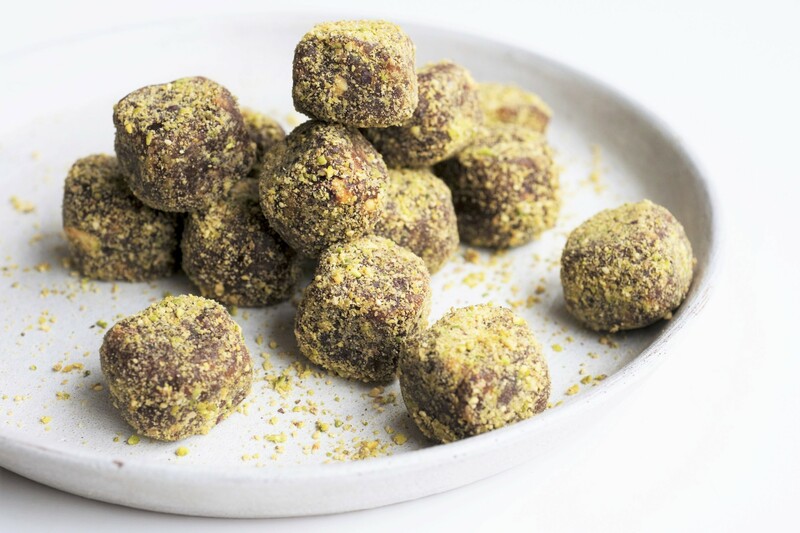 Here’s a twist on the Arabic date recipe…! Note: you’ll need a food processor to make these! Put the pistachios into a food processor and coarsely chop. Take out three quarters of the nuts and place them in a big bowl to one side. Then grind the remaining quarter into as fine a dust as you can, then tip it out onto another plate. Check the dates for stones, remove any you find and then put the dates into the food processor along with the Vita Coco Coconut Oil, cinnamon and blend. It will take a few minutes for the mixture to come together into a dough.